Commentators and media are already looking toward the centenary of the 1916 Rising. There has been much less comment so far on the centenary of the 1913 Dublin Lockout, also a pivotal moment in our history, despite the fact that July marks the beginning of the events one hundred years ago that led to the most intense labour struggle ever on this island. It was on Saturday, July 19, 1913 that William Martin Murphy, the main boss of the Dublin United Tramway Company and leading light among Dublin’s biggest employers, called a meeting of tram workers to warn them off joining the Irish Transport and General Workers Union(ITGWU). 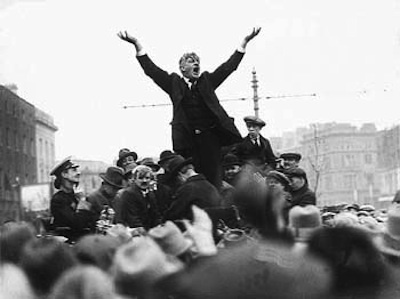 This new union was very effectively organising previously unorganised workers - especially in Dublin and Belfast - under the leadership of Jim Larkin and James Connolly. The story of the titanic struggle that ensued and went on to early 1914, makes uncomfortable reading today for the economic and political establishment in this State. That is because their antecedents shamed themselves with the horrific conditions they imposed on the working class of the day and with the brutality with which they fought to protect their wealth, power and privileges when workers began to organise effectively. Uncomfortable also because those who led the struggle linked the need to secure decent wages and conditions with a fight to challenge the prevailing economic system and go from a capitalist society to democracy and socialism. Unfortunately the 1913 commemoration is also hugely problematic for much of the main trade union leadership. That is because they have accommodated themselves to the self same system as it operates today and are enablers of the Fine Gael/Labour Coalition in the implementation of the brutal bailout/austerity agenda. They have refused to organise any serious industrial action against the draconian austerity being implemented because they seem to have faith in the capacity of capitalism and its political representatives to bring growth back. Such faith is misplaced but worse, their approach is a betrayal of the movement they inherited from Larkin, Connolly and the outstanding men and women of 1913. Their actions are akin to the British Trades Union Congress leaders who refused to harness the huge strength of the movement throughout Britain in support of the Dublin workers while the ranks were straining to organise solidarity. The current recession - more like a five year depression from an Irish point of view - is blighting the lives and aspirations of the majority in society. Having been promised virtually every month that recovery is ‘around the corner’, first by the Fianna Fail/Green Party government and now the Fine Gael/Labour Coalition, recently released economic figures show the Irish economy once again in decline. This is a desperately disappointing blow for people who were hoping for some respite from the doom and gloom. However, what the struggle waged in 1913 shows is that the capitalist establishment will always put its interests first and must be challenged on the ground to force a change. The actual story of 1913 is powerful and dramatic. The sacrifice and heroism displayed by thousands and the fiery, fighting and inspirational leadership, particularly from Jim Larkin and James Connolly, makes it hugely compelling and relevant. Over the next months I will return to the most dramatic events that characterised the Lockout as their centenary dates fall due. This is not only to pay tribute to the men and women whose huge sacrifice and unparalleled courage laid down markers that still benefit workers today, but also to analyse how these events deeply influenced critical developments over the dramatic years that ensued up to 1922 but which significance is not recognised in much of the ‘official’ history of the period.